The Giens peninsula is a geological curiosity unique in the world, which is connected to the mainland by 2 sand bars 5 km long, called tombolos. These two sand bars wrap around the Pesquiers salt marshes which are home to a remarkable ornithological reserve with its pink flamingos. Whether you’re based at a campsite, in a mobile home or apartment, the Giens peninsula is yours to explore. Discover the little village of Giens which has managed to hang on to all its Provençal charm and which, from its village square offers an extraordinary view of the Peninsula, the beaches and the town of Hyeres in the north, as well as of the islands and the endless blue sea to the south. On Tuesdays, you can browse the market stalls where you’ll find plenty of local and fresh produce such as tapenade, olives, anchovy paste, tomatoes and melons ... Then there are the fishermen from the port du Niel and the port de la Madrague who add to that typical southern atmosphere with their distinctive accents as they offer you their fresh fish, bream, sea perch, mullet and if the fishing has been good, perhaps even a few lobsters. The Almanarre. This 5 km long beach is located on the western tombolo. Here the sand is white and because the water’s very shallow it means very safe bathing for children. When the wind blows in from the west, our famous Mistral, you’ll find lots of windsurfers and kite surfers. Depending on how strong the wind is, the sea can be quite choppy and look superbly wild. When the wind is from the east, the beach is sheltered, and with it being so quiet all around the sea shines in a rainbow of colours that is quite a sight to behold. The Bergerie and Badine. These beaches stretch along the eastern tombolo. Because the waters facing the Iles d'Or are shallow, bathing is safe and easy and the fine sand you’ll find there is ideal for building the most beautiful of sand castles. When the Mistral is blowing, these beaches are sheltered from the wind. Le Four à Chaux, le Pradeau, la Darboussière and wild coves are where you can go if you fancy a quiet and relaxing dip near to the Madrague, the Tour Fondue or along the coastal path away from the bustle of the coastline. 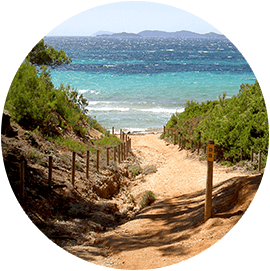 Hiking enthusiasts can enjoy 18 kms of coastal walks all of which are accessible from the Presqu’île de Giens, la Tour Fondue and Olbia campsites and the Gabiniere holiday village. 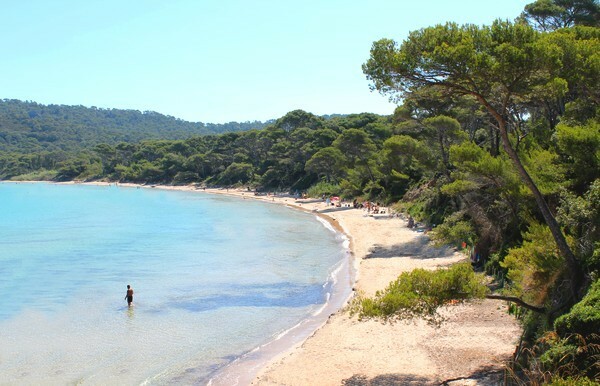 It’s a chance to discover a long list of islands, coves, beaches and small ports, which sometimes spring into view behind the branches of the pine trees which have been sculpted by the wind. You can also explore the Giens peninsula from the sea! If it’s your first dive or snorkelling trip, the club Espace Mer is on hand to introduce you to the flora and fauna that live under the sea. For paddle and pedalo rentals just call Emmanuelle, or you can take a trip out on a kayak or rent a boat with La Petite Flotille. The Giens peninsula has one of the most famous venues for water board sports: the Almanarre beach. If it’s thrills and spills or new experiences that you’re into, then why not try some windsurfing or kite surfing? The Giens peninsula has plenty of activities for families and friends alike to enjoy under the Mediterranean sun. For the perfect holiday on the Giens peninsula, set off on your very own exploration of the Îles d’Or. 3 Islands, 3 pearls of natural beauty, but also each with a different character to discover. A 15 minute crossing from the pier of the Tour Fondue is all it takes, to discover an island full of charm which you can explore on foot or by bike in the shade of the pine and eucalyptus trees. There are forts, fields of olive trees, vineyards, old lighthouses ... so many things to discover. To the south, a steep coastline with a few creeks nestling under the overlooking cliffs is more than worth a visit. To the north you’ll find sandy beaches and turquoise waters, ideal for bathing. This island is all about nature. The ile de Port-Cros which is the smallest National Park in France, has a number of hiking paths which run through the heart of the little island’s Mediterranean vegetation. All you need is some flippers, a diving mask and snorkel to discover the surrounding fauna and flora with the underwater path which starts from the beach of the Palu. A chance to see all the groupers, sea urchins, corals and star fish like you’ve never seen before. if you fancy spending a day in total harmony with the nature then head for the île du Levant. It’s the ultimate haven of peace, and there’s no simpler way to discover the wildness of the island. Take a stroll along the nature path amidst the strawberry trees towards cirque de la Galère. For a dip in the sea head down to the plage des Grottes for a 100% naturist experience at the water’s edge in the shade of the pine trees. 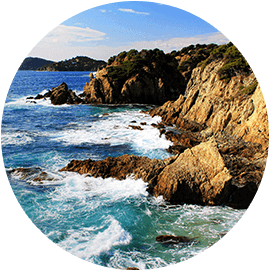 During your stay on the Peninsula with Vacances Giens, make sure you visit the town of Hyeres, with its heritage cultural and natural treasures,. Stroll through the old town with its narrow streets full of little shops with their handcrafted products, explore the gardens and find out about the entertainment and leisure activities on offer. Go into Hyeres and make your way up the narrow streets of the old town. The feeling of Provencal life is everywhere, among the fruit and vegetable stalls, but also with the cheese maker who is next to the bookseller, and the olive seller who greets you at the door of his shop. Take a coffee or a pastis on the place des Templiers. There’s the coloured linen drying on the windows among the bougainvillea and then there’s that lovely smell of fresh traditional bread or biscuits. What’s so surprising is that among all the hustle and bustle of village life, you can find craftsmen, artists painters, fashion designers, and decorative shops. Along your way, you'll see the tower of the Templars, the rue des Porches, the vaulted passageway under the old ramparts, the Saint-Paul collegiate church, the narrow streets, paved with history, as they climb up toward the castle from where there’s a breath-taking and quite unique view over the town, the Presqu'ile and the Islands. For a more modern and contemporary architecture look no further than the villa Noailles which was built in 1923 and which hosts exhibitions all year round including the International Festival of Fashion and Photography as well as the Design Parade. Hyères-les-Palmiers is a town all about nature as we think you’ll agree when you take a relaxing stroll through the town’s parks. The Castel Sainte Claire, which you can reach by the narrow streets of the old town of Hyeres, is where you can explore a subtropical garden with its plants from South America and Australia. The Olbius Riquier Garden, with its play area, small train and sweet shop for your children. Take a stroll in this park with its bamboo, cactus, palm trees and many other types of exotic vegetation along with its many peacocks. The town of Hyeres offers a wide range of holiday activities. There’s a craft market every day of the week in Hyeres and its surroundings which is a great way of trying out the local produce. On the Peninsula why not pay a visit to the Giens market which is open on Tuesday mornings and the marché de la Capte which is on Fridays (4km from Giens). If it’s thrills and spills you’re after, then head down to water sports complex in Audemar (l’Ayguade 7km) where you can jet ski, or to the Speed kart for some kart racing (direction Hyeres 6km). The children might like the day out at Kiddy Park, where there are water games, mini quads, inflatable games and accro-branches (tree climbing with ropes) and everything else you could want for a great time! Then in the evening there’s the Magic World funfair with its dodgem cars, its haunted house, roller coaster and other fun rides all guaranteed to provide a thrilling experience. The Var département is also yours to explore during your stay on the Giens Peninsula.